I had to comment on this. The reporting in the US is disgustingly self-serving and/or pandering. Disclaimer: The following text is at the end of this as well. Obesity is a charged word. Some people hear it and think bad things about someone. Others hear it and get angry because we as a society are not "fat-accepting." Whatever your weight is, you are beautiful. You are you. Accept yourself for what you are today. You may wish to make physical changes, but first, love yourself. A recent article that appeared in newspapers and magazines throughout the country had the following headlines: "Fit and fat: US study shows it's possible." and "Study: Fat people not necessarily heart risks." The real headline should have been "Study shows strongly positive correlation between large weight to height ratio and symptoms of metabolic syndrome." Of course since excess fat accumulation is also a symptom of metabolic syndrome, this would not have been a surprise to anyone. From the headlines you would think that the article will say that obesity is OK, and the article kind of does say that. It emphasizes that not all people defined as obese have metabolic problems and many people defined as "normal weight" have metabolic problems. This table shows what the study actually describes. Obese people have a much higher probability of cardiometabolic abnormalities than lighter weight people. Even if you are light weight, you still have a chance of cardiometabolic problems. The articles do not discuss causality or mitigation techniques, just correlations and associations. The New York Times article was more even-handed than most. If you read nothing else in this post, I hope you understand how misleading the reporting is on the story. There are some interesting potential issues not brought up in the articles. The first is the definition of obesity. Typically, researchers apply the obese label to anybody with more than 30 BMI. Notice there is no mention of fat at all in the equation. Walter Payton, one of the great running backs in NFL history was 5'10" and 210 lbs. His BMI was 30.1. By this definition he was obese. He was in no way fat. His body fat must have been 10% at that weight. I am no Walter Payton, nor are you, but this points out the flaw in BMI, it makes some gross assumptions about body composition that may not be true for any individual. So of the 31% of "obese" people who had good metabolic indicators, how many were strong athletes? On the other send of the spectrum are the skinny fat people. They have a low BMI, but they work really hard with cardio and diet. They have probably had weight problems in the past and have experienced some yo-yo dieting. Their arms and legs are skinny, but maybe they have a bit of a gut. These people can easily have body fat percentage greater than 25%, yet they count in here as skinny. I would estimate that there are more people in this category than fit people in the obese category. There are probably lots of both in the overweight category. A better metric mitght be the FMI or Fat Mass Index. It is very similar to BMI and is in fact a component of it. According to this link (which also has an FFMI calculator), an upper limit FFMI for a steroid-free person is about 25. This abstract addresses the variations in FMI and FFMI associatedf with given BMIs. Here's another one. Second, there were no indicators of age in the articles. What factor would age play in cardiovascular and metabolic risk. Does it matter how long a person has been overfat? Wouldn't a person become more insulin resistant over time. How many of the healthy overweight and obese people in the study were still young and have not had time to build up insulin resistance? Finally, the measures used were blood pressure, cholesterol, triglycerides, and blood sugar. It did not measure actual mortality, only factors that correlate with problems. We don't know if heavier people would have lower mortality from other causes. So I believe we should define obese in terms of body fat, not BMI. 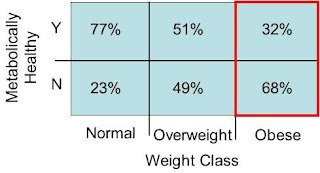 It's a continuum really and different people carry fat differently and our measurement techniques for body fat are inaccurate, so I will define obesity as follows: If you are a male and have more than 20% body fat or a female and have more than 25% body fat you probably have some health issues causing fat accumulation. If you don't have access to a reliable body fat measuring device, consider the following. If you have a BMI over 30 and think that maybe you are not actually obese, one way to measure it is through strength. If you are a male, drop and do 25 high quality push-ups. if you can't pretty easily, you probably have too much fat. So What? Is fat bad? I'm not sure really. Excess fat is often a symptom of some underlying physical problems, although it may not be bad in and of itself. We are taught from an early age that "beauty is only skin deep" and "don't judge a book by its cover." That doesn't change our visceral response to obesity. Self-esteem: If you are obese, love yourself. It is a physical condition, not reflective of who or what you are as a human being. Nonetheless when people judge you continually it is hard to to keep your head up. External perception: If you are obese, it is likely that many people will look at you differently. People do judge books by their covers. It's not fair. It's real. It crosses all cultures. Underlying issues: If obesity is a reflection of an underlying issue such as metabolic syndrome (insulin resistance, high blood pressure, high triglycerides, low HDL, and central body obesity), it may be a signal of unhealthy lifestyle and eating habits that can lead to heart disease. Much obesity in the United States is reflective of these underlying issues. Do not use the articles cited at the beginning of this post as a reason to not take care of yourself. Obesity either carries risks or is symptomatic of other risks. This blogger has an interesting perspective. Her viewpoint is that obesity is a fact and part of our culture. We should learn how to medically treat people with obesity rather than simply blaming their problems on the obesity. Obesity is a charged word. Some people hear it and think bad things about someone. Others hear it and get angry because we as a society are not "fat-accepting." Whatever your weight is, you are beautiful. You are you. Accept yourself for what you are today. You may wish to make changes, but first, love yourself. The following link is a tool that can assist you in measuring your body fat percentage. It's cheaper than a Tanita scale and can give you another perspective on your health. Please read more of JFS and other sources because you're really not getting the science. Hi anonymous, Thanks for commenting. I read junk food science regularly and appreciate her point of view, even though I do not always agree with her. Is there some part of this post that you disagree with? The first part is more about reporting of science than the science itself. The second part is some really high level reasons to not be obese. So please help me out. What science am I not getting? if you are fat, people look at you and think you are stupid. we hired a bunch of new programmers where i work. for the longest time it was just me and this old jewish guy who were the fatties. when we got a couple more fatties i went up to them and told them i was glad to see them working here, because the only people i think are any good at computer programming are fat people. Thanks for the comment. From your wink, I am assuming that you mean fatties in a good natured way. It is ironic that the correlation may actually be opposite of the societal assumption. Some overweight people may be that way because their focus has been on the mental rather than the corporeal part of their existence.